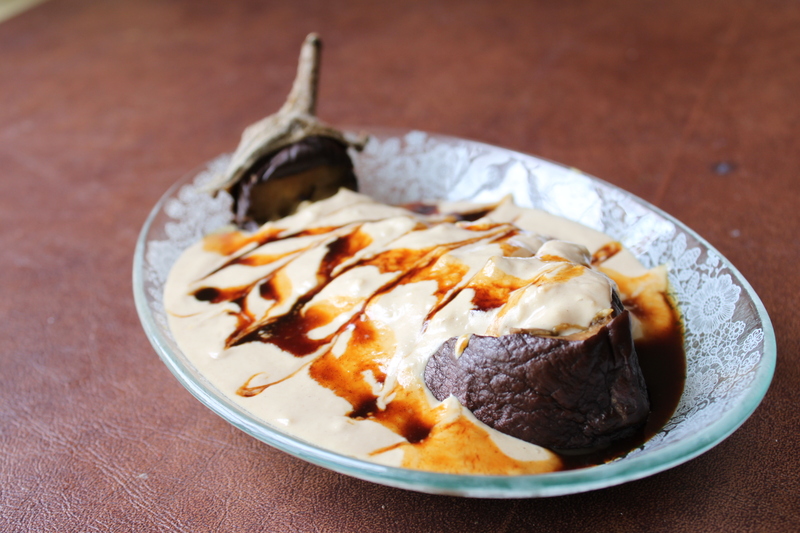 Traditionally, the eggplant is grilled directly over an open flame, and then cut open and slathered with delicious, lemony, garlicky tahini salad. 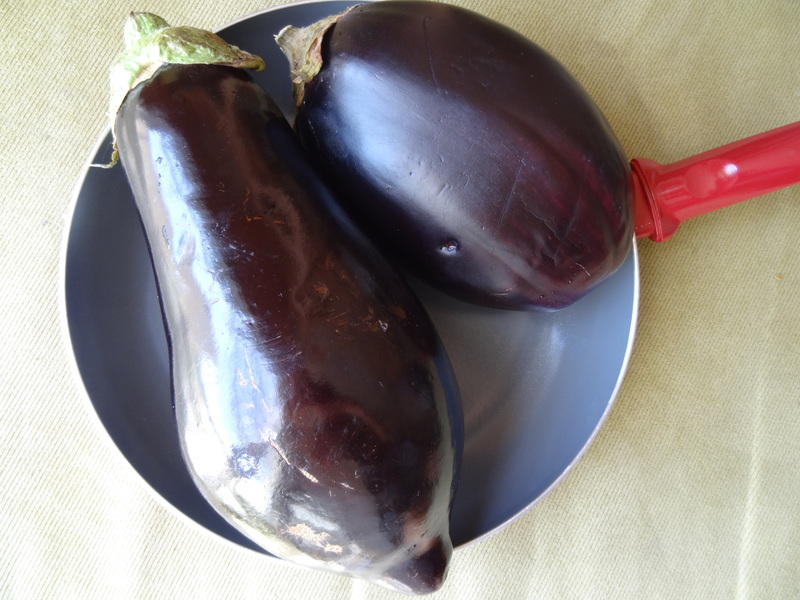 If truth be told, I find the flavor of the eggplant to be slightly better when done the traditional way, but: 1) not everyone has a stove-top with an open flame, and 2) it makes such a huge mess, that for the frequency at which we make this at our house, it’s just not worth it. For this reason, I “food hacked” this recipe even further and found that you can get a nearly-identical result by dry-grilling in a dry frying pan. 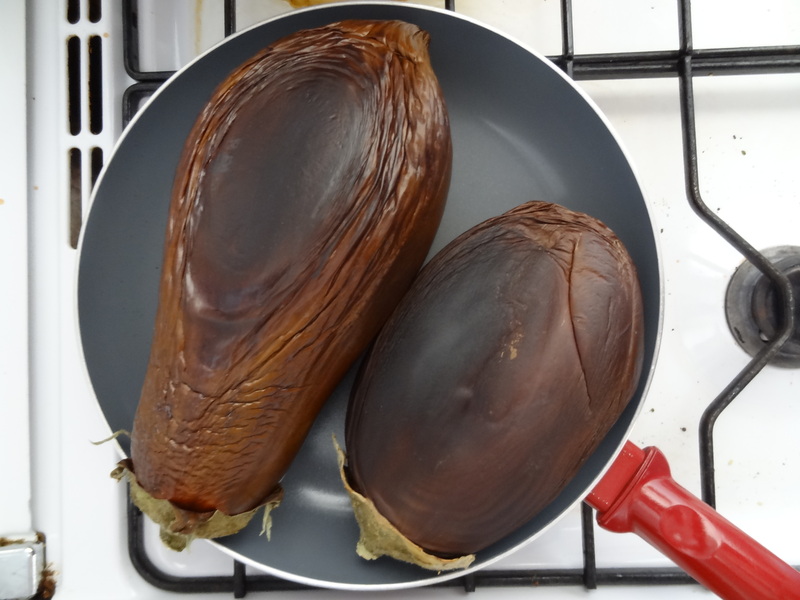 If you have a gas stove-top you don’t mind getting eggplant juices all over, or an open-flame grill, go ahead and roast it directly over the fire. Otherwise, stick with the pan. It won’t let you down. I keep using raw tahini in all these recipes, and I try to make sure to reiterate the difference between that and the store-bought tahini salad, just to avoid confusion… Raw tahini is awesome and can be used in almost anything (in my kitchen, it is used in almost everything – so much that my friends suggested I change the name of this blog to The Tahini Kitchen). 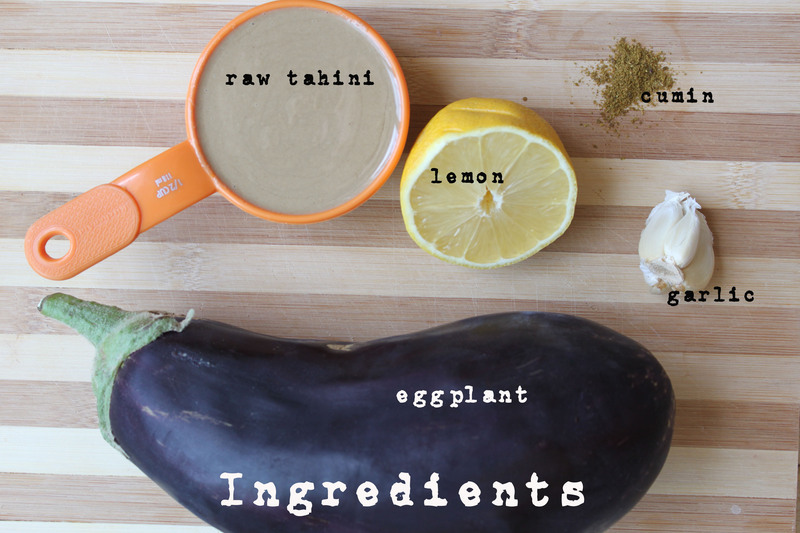 But I realized lately that I never got around to explicitly saying how a “normal” tahini salad is made (that is, how to use raw tahini for its most conventional use). I will do that in this post. 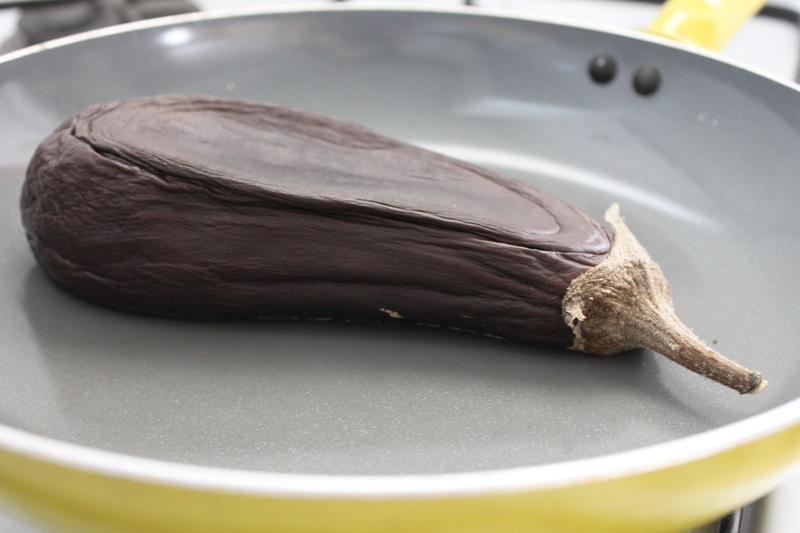 Wash and dry the eggplant, and place it in a dry pan over medium-low heat. Let it sit there. You will notice, after a while, that it will start to look “bruised” – it will start to turn a rusty brown color which will start at the bottom and work its way up. 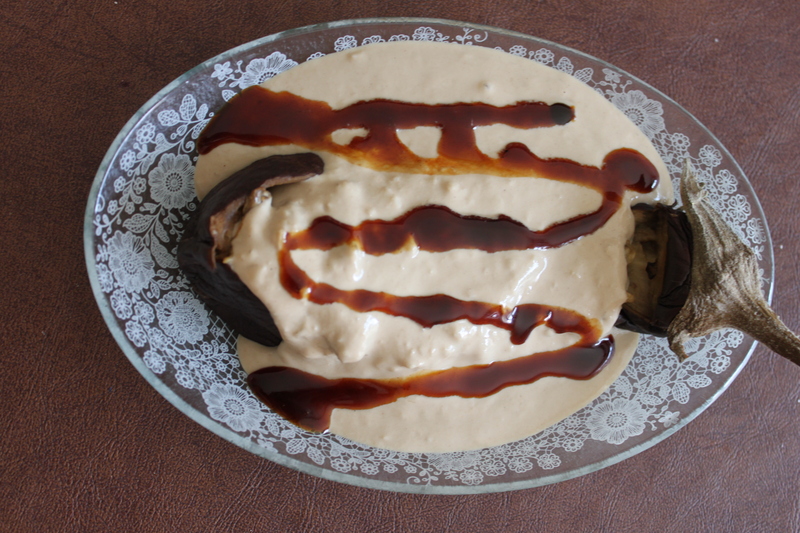 Once the entire top of the eggplant (the side not touching the pan) has turned brown (about 20 minutes), flip it over. Cook for another 20 minutes, then poke a hole through the top with a fork and flip it over. 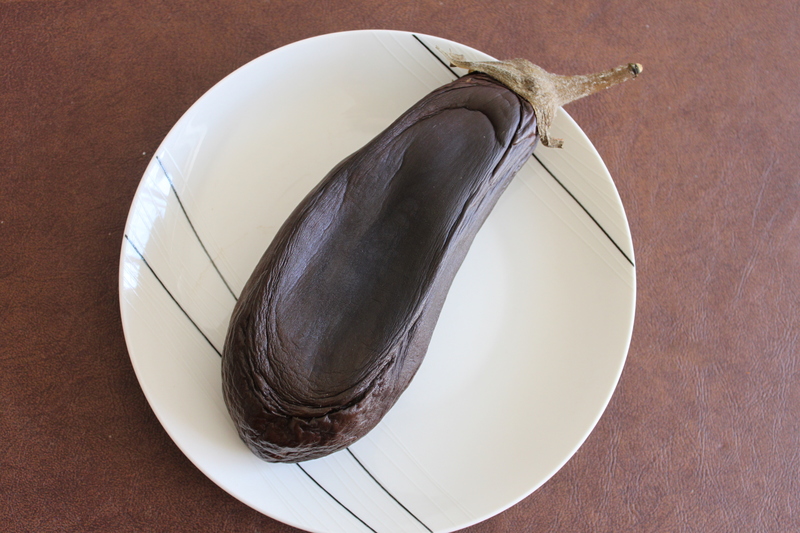 Cook for 10 minutes, or until the eggplant starts to look like it’s deflating. 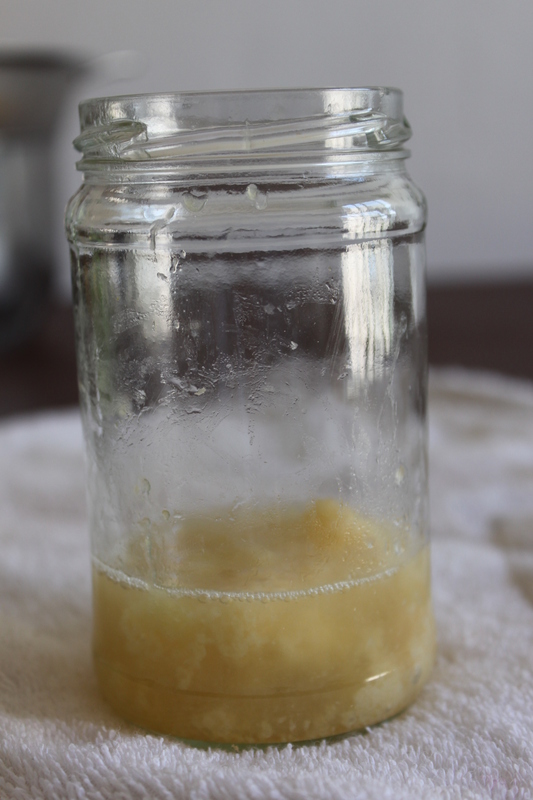 Place the minced garlic along with the lemon juice and pulp in a small jar, and shake around to combine. Add the tahini, and shake vigorously (with the lid tightly screwed!) until thoroughly combined. Then start alternating adding a bit of water and shaking vigorously, until the desired consistency is reached. 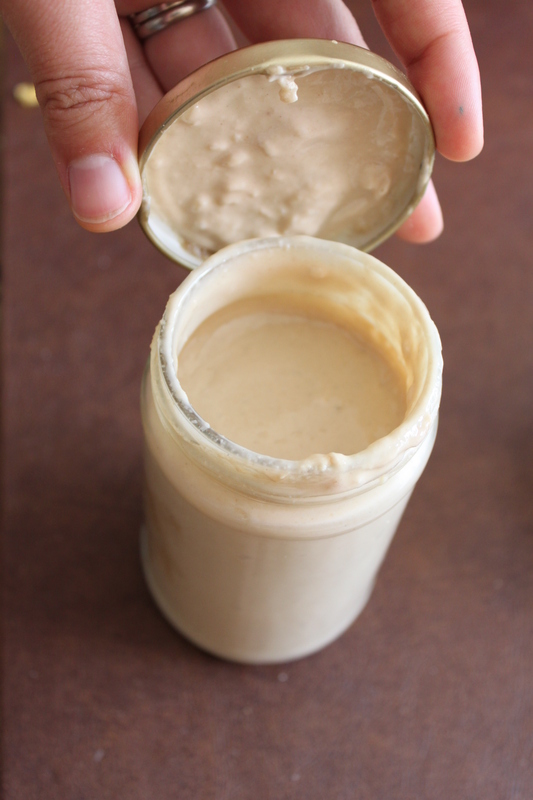 I prefer my tahini on the thicker side, but some people (such as Mr. Graceful) prefer it slightly thinner. 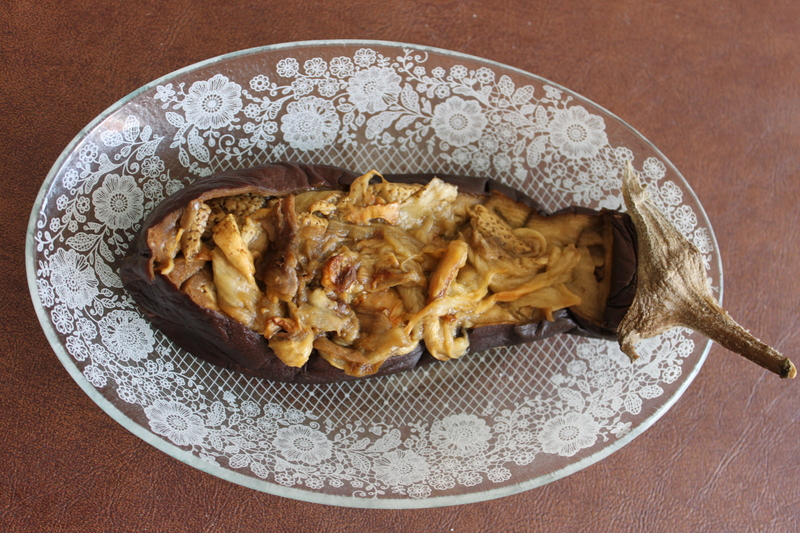 Once the eggplant looks completely deflated, ruined, burnt and mutilated, it’s ready to be used. 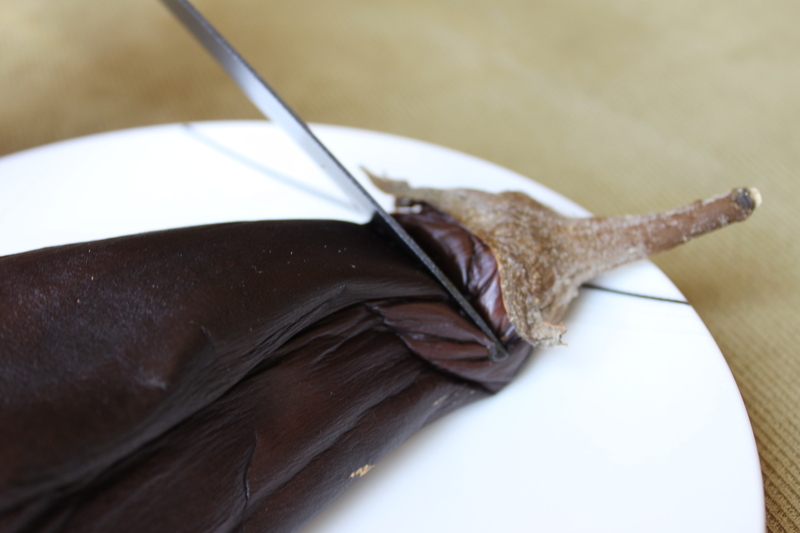 Cut along the stem of the eggplant, about half-way deep. 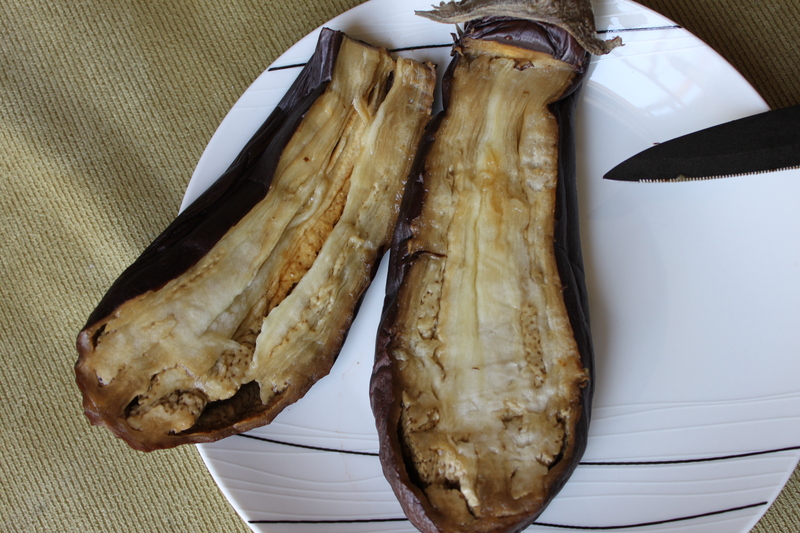 Then, cut the eggplant in half length-wise, so you are left with what kind of looks like two eggplant-shaped “boats”. Cut a crisscross pattern along the meaty surface of the bigger one (usually that will be the one with the stem still attached). Then scoop out the “meat” of the other half, right on top of the half you just cut. The skin can be thrown away, saved for veggie stock, or given to the people in your kitchen who eat vegetable by-products (for me, it’s my sister in law, who waits patiently for bits and pieces and then devours them). 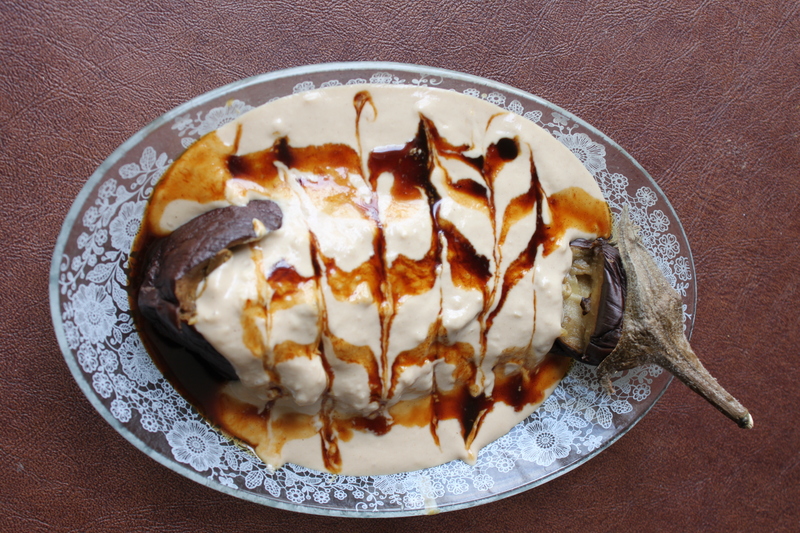 Transfer the eggplant to the dish in which it will be served – a slightly deep dish will work well to ensure the tahini doesn’t drip out. 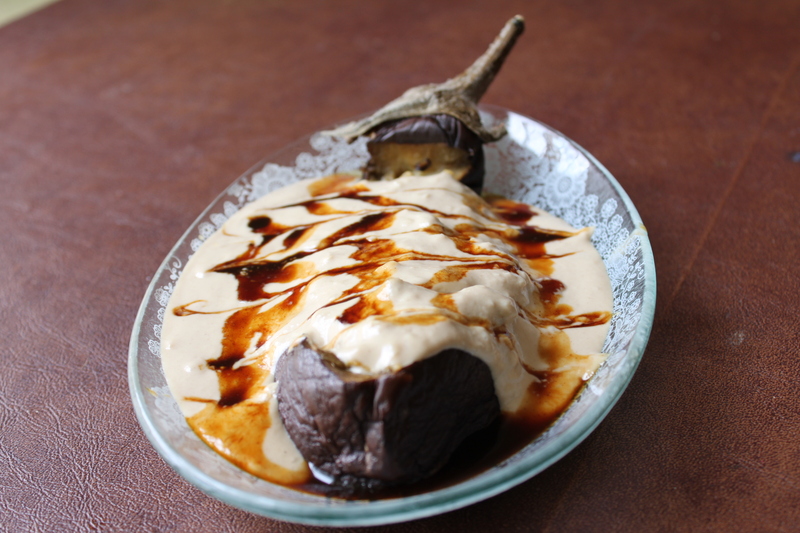 Sprinkle the ground cumin evenly on top, and then pour the tahini salad over everything. It’s ready! 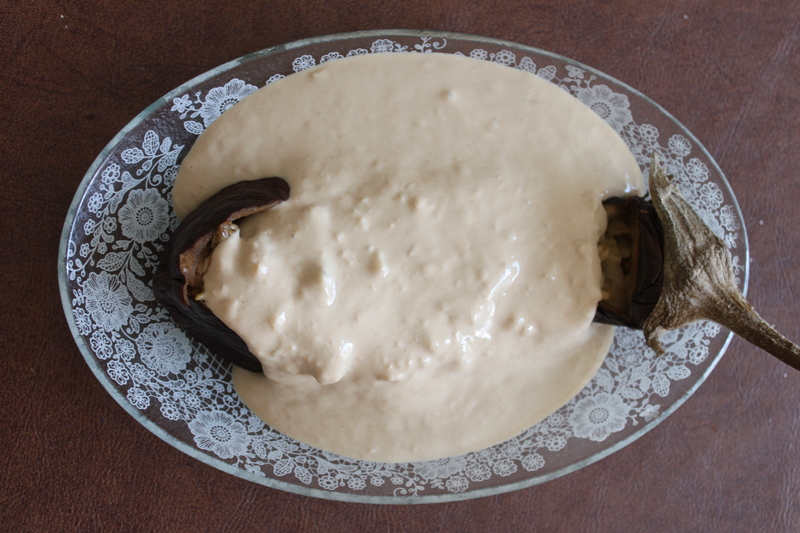 But if you want to give it a decorative touch, take some sweet or tangy syrup (such as honey, date honey, or pomegranate syrup), and use it to “draw” a zigzag line across the surface of the tahini. Then use the tip of a knife to lightly drag the syrup back and forth in opposing directions, to create a decorative pattern. The thicker the syrup you use, the more aesthetic the result [I only had date-honey on hand, which is not very thick (as you can see in the pictures), even after I chilled it for a long time]. 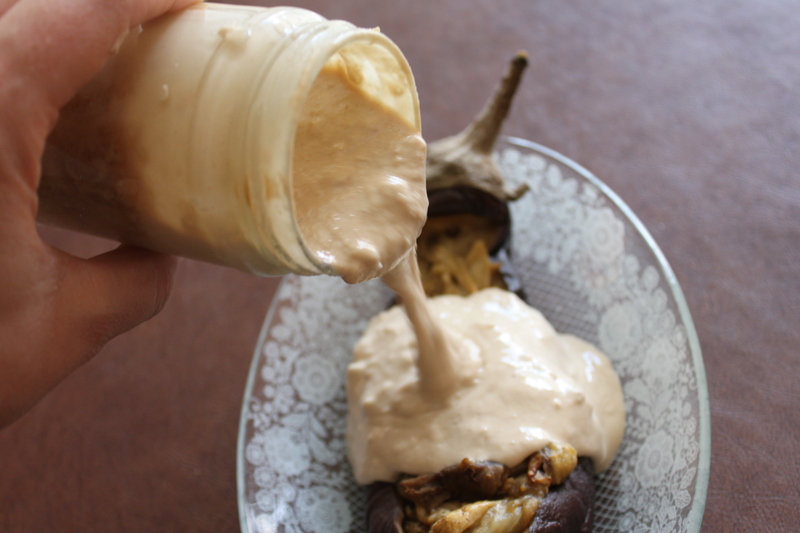 If you want to make this ahead of time, keep the tahini in the jar right up until serving, since it will dry out along the edges and won’t look very appealing. If preparing directly on the flame, line the stove top with aluminum foil to minimize the mess. 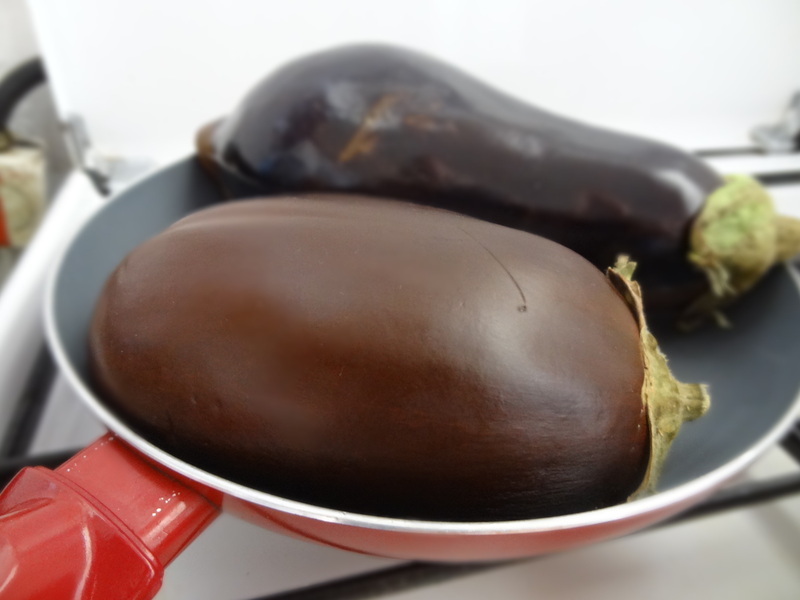 Place eggplant on frying pan over medium low heat (or on wire rack directly above flame). 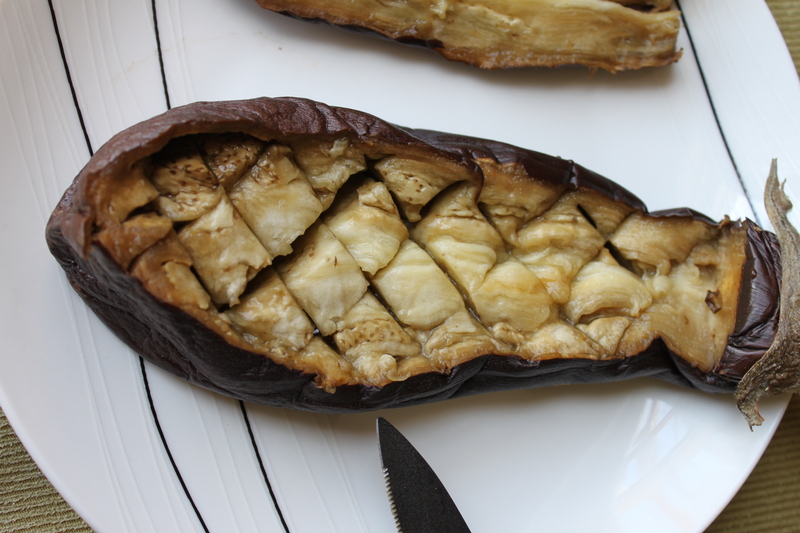 When eggplant “bruises” completely on top, flip over and cook the other side. 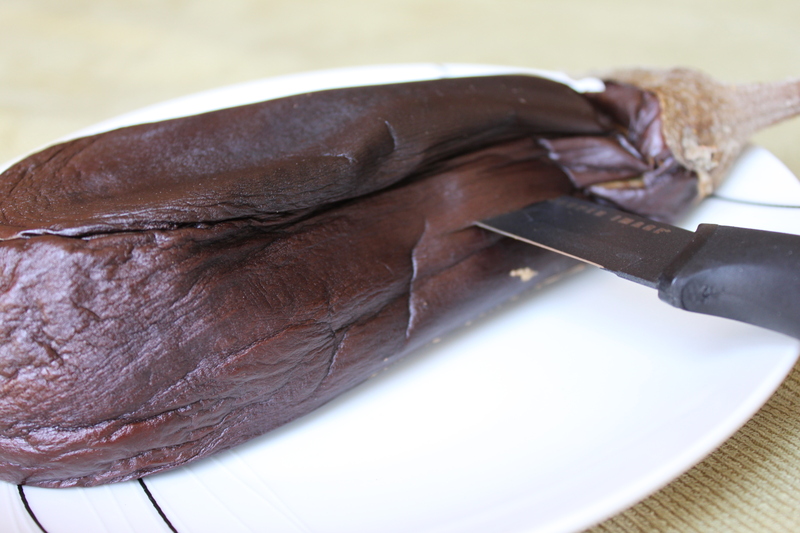 Poke eggplant with fork and cook for another ten minutes or until it looks “deflated”. 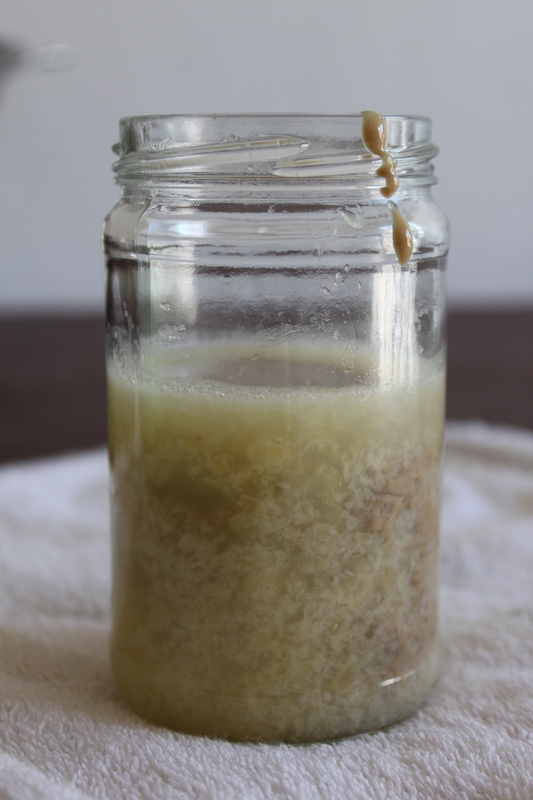 Prepare the tahini salad: place 3 minced garlic cloves, juice of 1 lemon, and 1/2 cup tahini in a small jar, screw shut and shake to mix thoroughly. Continue shaking and adding water alternately until desired consistency is reached. 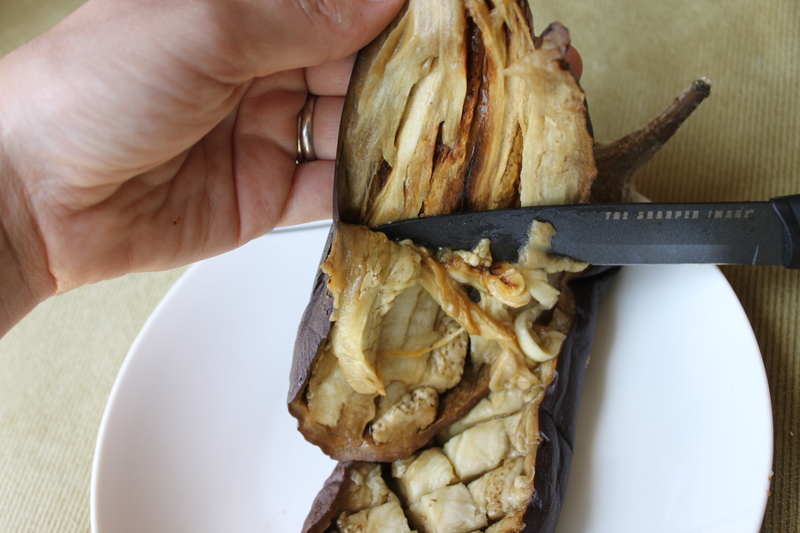 Cut eggplant in half length-wise. Cut a criss-cross patter across the surface of the bigger half, and scoop the “meat” of the other half onto it. Sprinkle 1/2 tsp ground cumin over the eggplant. 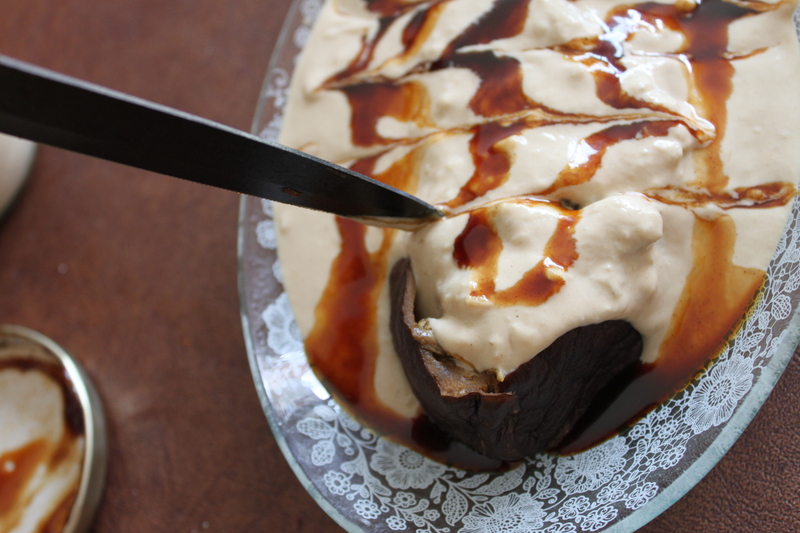 Pour tahini salad over eggplant. 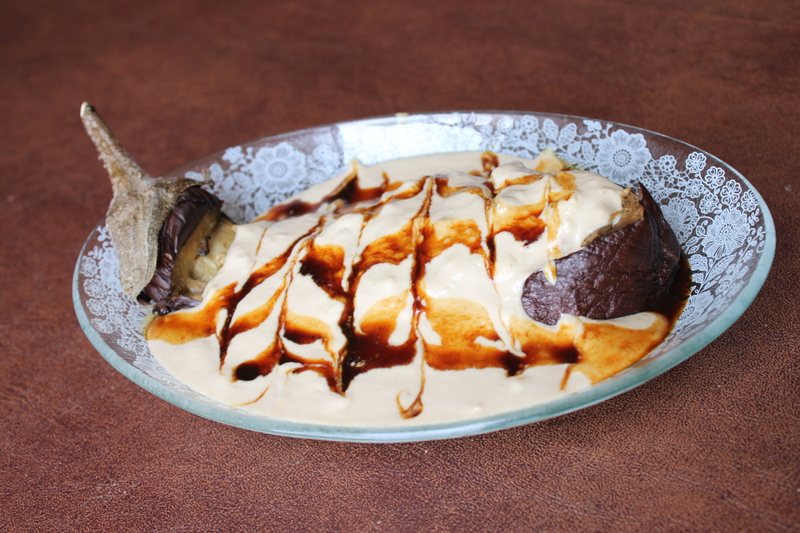 Optional: Using honey, date honey, or pomegranate syrup, draw a zigzag line across the tahini’s surface. Then drage a knife through it in opposing direction to create a decorative pattern. 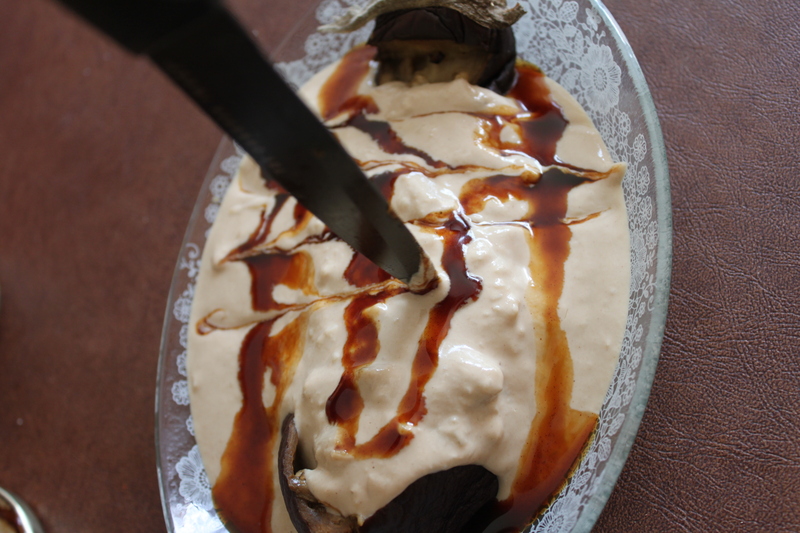 This entry was posted in Appetizers & Snacks and tagged eggplant, gluten-free, Middle-Eastern, non-dairy, raw, tahini, vegan by Adi. Bookmark the permalink. Looks great and Yummy! and the pictures are so beautiful!!! Looks great! Good luck, Adi. Great having the pictures as well. Though I remember eating the same dish but with toasted pine nuts. Mmm, pine nuts sound like they would go really well with this… Just made it last night with fresh pomegranate seeds instead of the molasses, seeing as they are in season! Thank you so much Elaine! I am really excited about exploring your blog as well! Wonderful! Thank you :) you’ll see I have an entire tahini category!! !